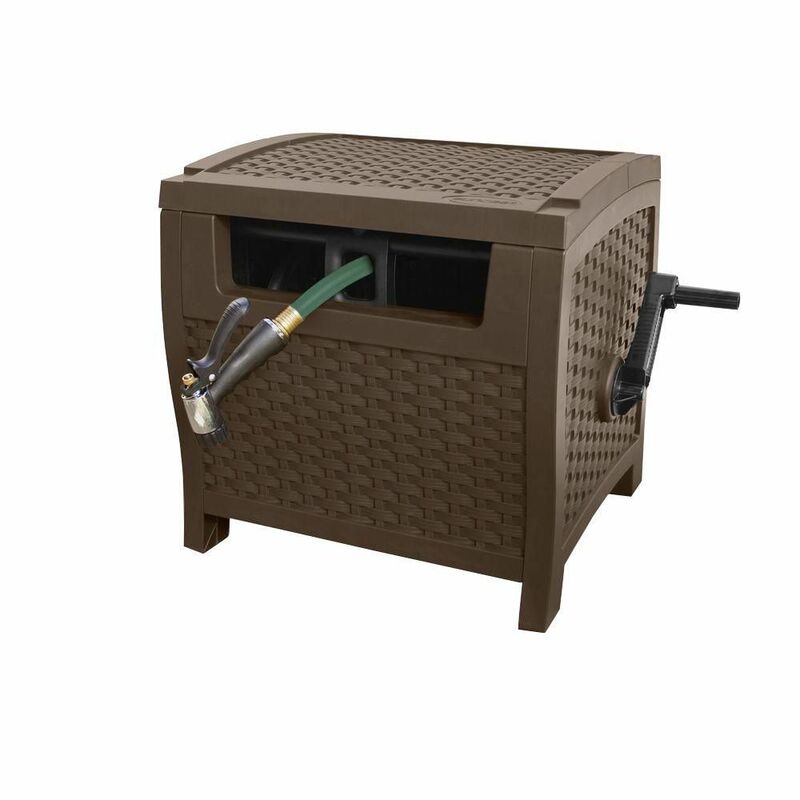 This Suncast wicker look hose hideaway is the perfect complement to any backyard dicor. The Slide Trak hose guide distributes the hose evenly onto the reel and makes winding easier. Attractive design fully conceals the hose. Hose capacity - 175' of 5/8"
Perfect for narrow, small space watering. Its lead-free construction makes it ideal for all types of gardening including vegetable gardens. With 6 holes per foot, this Element hose provides a consistent and uniform watering pattern. The Liberty Model 671 Decorative Hose Butler mounts onto almost any surface and is easy to install. Features non-rust, cast aluminum construction; a decorative patina design, and a durable powder coat finish. Slide Trak 175 ft. Capacity Resin Wicker Hose Hideaway This Suncast wicker look hose hideaway is the perfect complement to any backyard dicor. The Slide Trak hose guide distributes the hose evenly onto the reel and makes winding easier. Attractive design fully conceals the hose. Slide Trak 175 ft. Capacity Resin Wicker Hose Hideaway is rated 3.2 out of 5 by 45. Rated 5 out of 5 by Cindi from I bought this as a gift for my daughter; she loves it. It is build very solid and is not to large... I bought this as a gift for my daughter; she loves it. It is build very solid and is not to large on her patio. Rated 2 out of 5 by disappointed from The reel itself is very good. Hose was easily reeled. The additional hose piece that connects ree... The reel itself is very good. Hose was easily reeled. The additional hose piece that connects reel to hose has steel fittings that have already rusted. In addition the hose piece has both female ends on it. When you connect a hose to it you can't put any attachment on the end since it is also female. The hose piece also rusted to the hose and was nearly impossible to get the hose off. Will need to buy an adaptor (at an extra cost) so I can have a hose that can take a attachment at the end. Rated 1 out of 5 by JustMe from Garbage The feeder doesn't move when winding in the hose, so you need 4 hands to do it properly. And if you don't turn the unit in the direction you are pulling the hose toward or winding from, it's super difficult. Rated 1 out of 5 by Smiley77 from ITEM NOT AS DESCRIBED!!!!! If you are looking to purchase this item because it has the “SMART TRACK” DO NOT PURCHASE!!!!!!!! This item is describe online as having the “SMART TRACK” that distributes the hose evenly onto the reel and makes winding easier.” However, we we received the item it only has the “SLIDE TRACK” I have been fighting and getting the run around from Home Depot Customer Service, Home Depot Head Office and Suncast the manufacturer of the product with NO RESOLUTION after 7 WEEKS!!!!! The summer is over 1/2 over and we haven’t used them yet! I am returning them and purchasing another brand from somewhere else!!!! DON’T BE FOOLED BY THE DESCRIPTION ONLINE...TRUST ME!!!!!! Rated 2 out of 5 by Nabob from The crank Handel needs to be redesigned, it keeps popping out while you are trying to re wend hos... The crank Handel needs to be redesigned, it keeps popping out while you are trying to re wend hose. Ended up using epoxy glue to permanently seat the crank Handel. Rated 3 out of 5 by Jsg33 from It is what it is. Attractive on patio, and we... It is what it is. Attractive on patio, and we don’t trip on hose any more. Anchoring on tiles is an issue so it tends to drag along behind. Could use a third hand.